Day 1, we will talk about your preparation for coming to a match and equipment check, how to set up your gear on the line and mental preparation to begin firing followed by slow fire speciality drills. 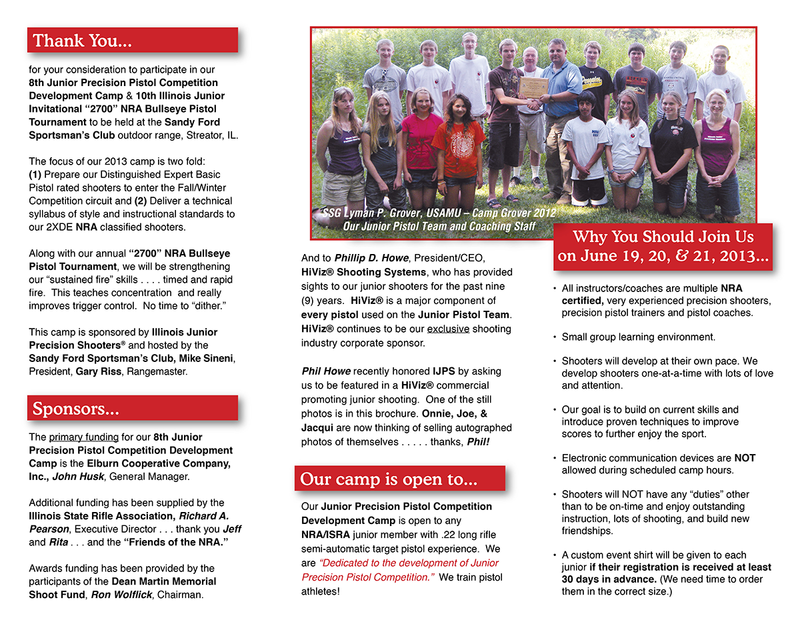 Day 2, we will develop a shot plan for some and review the shot plans of the experienced shooters. Drills, drills, drills! Followed by an open discussion on competition shooting. What will it take to get me to the next level? Introduction to sustained fire and shooting steel targets. After dinner on Day 2, we will clean pistols . . . . the correct way . . . . . yes, it will take three plus hours to do it right. Bring your cleaning kits and an apron or old shirt because you will “splatter” solvent all over the front of you. Leave your jewelry at home today. Note: Check your cleaning supplies inventory BEFORE you come to camp. I have plenty of inventory to fill in what you are missing so let me know in advance and I will have it there for you. Day 3, putting it all together. 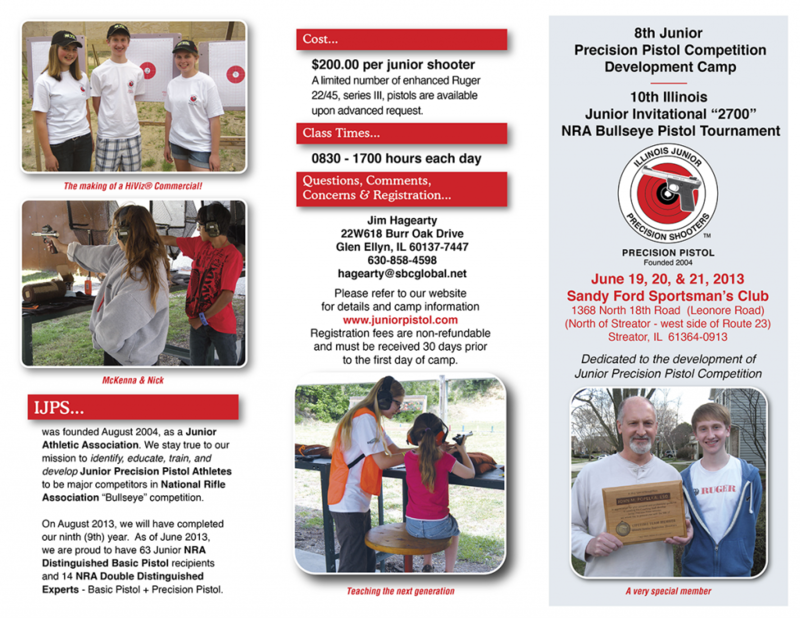 SSG Grover will provide an assessment of each shooter and help you develop a personal plan to grow your shooting skill level. Working on your weak areas. Speed on the 6″ steel plate rack. Awards ceremony. 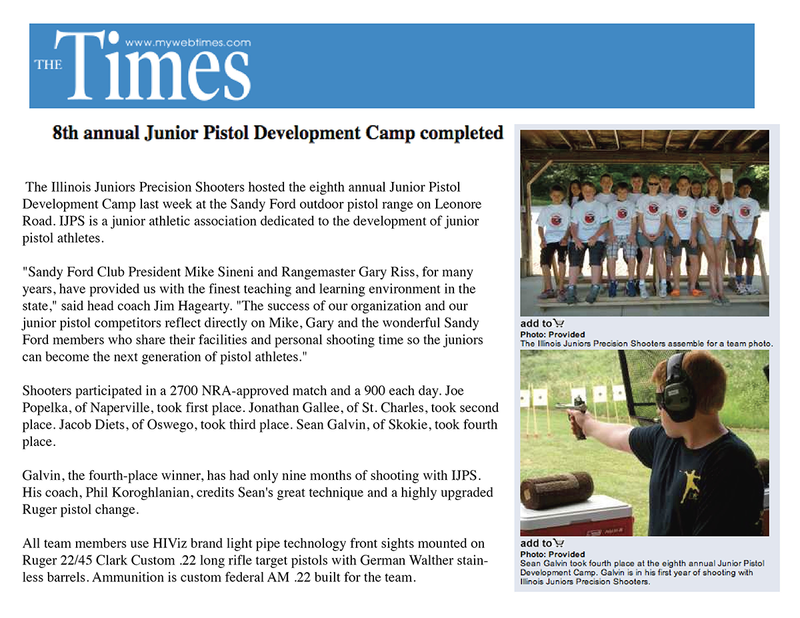 Awards: Certificates will be awarded to all shooters and support staff. IJPS medals will be awarded to the high four Grand Aggregate juniors. The Official 2012 IJPS Team photo will be taken, with SSG Grover, at the awards cermony. Cost: $200.00 per shooter which includes lunch each day. Housing: We have a special rate ($60.00) at Budget Inn & Suites, 1705 North Bloomington Street, (815) 672-0080, just North of the Sandy Ford indoor range. “Rocky” is the General Manager. I will be staying overnight Tuesday, Wednesday, and Thursday evenings. This is an excellent property with a Continental breakfast, swimming pool, and Wi-Fi. Please make you own room reservations. Lots of good places to eat near the motel. What do I need to bring to Camp Grover? A roll of ¾ inch Scotch® brand “Magic® transparent tape.” Purchase the one in a clear plastic dispenser so you can refill it when it becomes empty. An old bath size towel to place under your pistol and magazines so you do not damage the finish on the receiver & barrel. If you are staying overnight, a bathing suit . . . . the motel has a pool. “Rocky” is the Innkeeper – has been a friend for several years. Reservation block is under JCH’s name. Please make your own reservations. All old ammo in your possession. We want to make sure all old ammo is shot up first so we know everyone is shooting out of our new match grade lot. Hoppe’s® brand oil is a must to keep the chambers clean and extraction of brass cases from the chamber are reliable. As we learned this past weekend, even a “stainless” steel receiver/barrel can “rust.” All pistol owners must have a silicone cloth and use it at the end of each day on the pistol and magazine(s) to protect your investment. As a youth, this is probably your most high value (expensive) asset. Take care of it and it will function perfectly and look new for generations to come. A comfortable folding chair for use on the range when you are not shooting. Please bring all your “old” Federal AM22 rimfire ammo . . . . . I want to make sure all lots of ammo are expended (shot) so we are all using the new product that was manufactured for IJPS. Don’t forget your red IJPS pen on a rope . . . . . . and note taking pad. There will lots of info provided to all of you by SSG Grover and the IJPS coaching staff. Magazine loader . . . . . for those of you who own your own pistols. Lens cleaner for your shooting glasses and optical sights + a clean, soft handkerchief. Consider a small cooler to hold water bottles and ice . . . . . . . . . you need to stay hydrated while shooting and being outside. On Thursday evening, after dinner, I will conduct a Ruger® 22/45 cleaning class. All are welcome, but those of you with new pistols, it would be very helpful and informative for you to attend. The class will run about 3.5 hours in length. If you have cleaning materials, please bring them with you. If you need a cleaning kit or individual supply items, please call me ASAP and I will bring them to camp. Sandy Ford Sportsman’s Club outdoor range location: 1368 North 18th Road, Streator, IL. Mapquest.com has a great map from your front door to the front door of the Sandy property. Take the road all the way to the end and we will be there. I will have the gate open, each day, no later than 0800 hours as we will be setting up for the day. Please call me if you have any questions. We are looking forward to an outstanding week of education and training. Questions, comments, &/or concerns? Please call or e-mail me. © IJPS All Rights Reserved.